The Coding and Payment Guide for Behavioral Health Services is your one-stop coding, billing, and documentation guide to submitting claims with greater precision and efficiency. 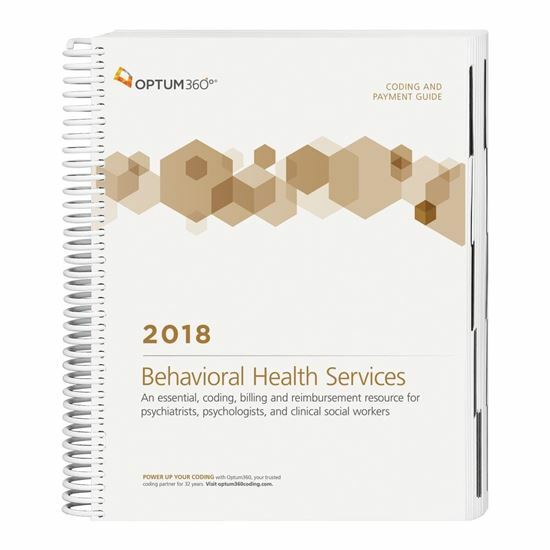 This guide has the latest behavioral health-specific, 2018 CPT® and HCPCS procedure, ICD-10-CM and HCPCS Level II code sets along with Medicare payer information, CCI edits, helpful code descriptions, and clinical definitions. New — Code icons. Quickly identify new, revised and add-on procedure codes related to behavioral health. Quickly find information.All the information you need is provided, including CPT® full code descriptions, lay descriptions, coding tips, procedure code-specific documentation and reimbursement tips, CPT® Assistant references, and Medicare references. Avoid confusion with easy-to-understand descriptions. Includes clear lay explanations of procedures represented by CPT® and HCPCS procedure codes. Prevent claim denials and stay up-to-date with Medicare payer information. Review Medicare Pub. 100 references containing information linked to HCPCS Level II and CPT® codes tailored to behavioral health services, to prepare cleaner claims before submission.